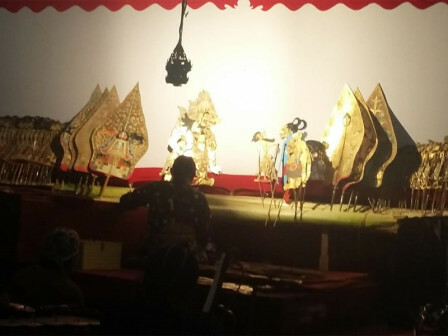 The Indonesian Puppeteers Association (Pepadi), held wayang kulit (puppet village) performance titled 'Mbangun Candi Saptoargo', in the field near SMPN 263 East Jakarta, Friday (10/19) night.
" It is a series of the Pepadi secretariat office inauguration that is located at Jalan Dukuh V, Kramat Jati, East Jakarta"
"It is a series of the Pepadi secretariat office inauguration that is located at Jalan Dukuh V, Kramat Jati, East Jakarta," expressed Ki FH. Bambang Soelistyo, Chairman of Jakarta Pepadi, Saturday (10/20). The performance itself was led by orchestrated by Ki FH. Bambang Soelistyo and Ki Reky Putut Sugiyanto that tells about lessons about respecting ancestors in cultural ways. "As the young generation, we must maintain silaturahmi," he explained. It is a routine agenda in a bid to introduce wayang to the people and preserve wayang art by involving all aspects such as residents and government. "That means this is not about Pepadi only, but also role of people," he stated.